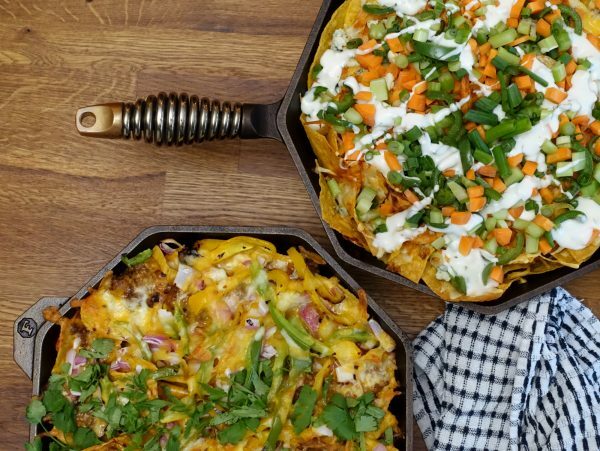 Buffalo Chicken Nachos | FINEX Cast Iron Cookware Co.
Nachos are a great crowd-pleasing appetizer, especially when served during a big game or anytime friends are gathered in front of the TV. These Buffalo Chicken Nachos (shown above, at top) blend two of our favorite sports bar foods, and improve them both with a FINEX cast-iron presentation that keeps them hot longer than ever. These Buffalo Chicken Nachos are inspired by a local Portland craft brewery favored by our small team of perfectionists. Interested in more nachos? Try our Smokey Chipotle Recipe, also pictured above. 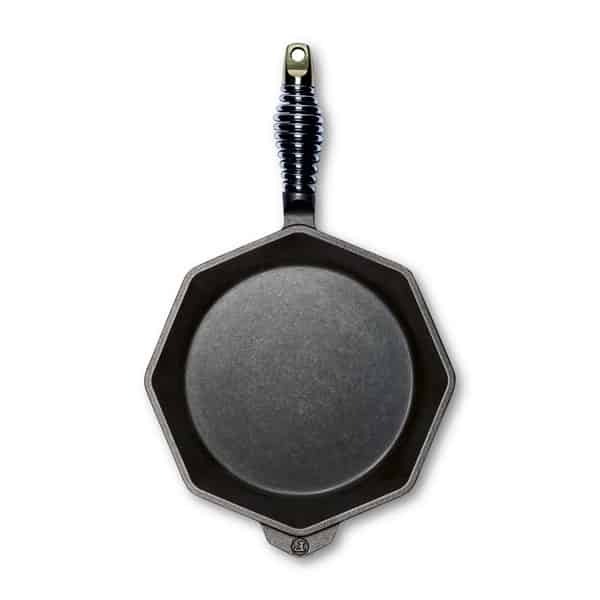 Place FINEX Skillet on the range and turn on heat to medium low. Slice jalapeño peppers into rounds (remove seeds if desired). Sauté peppers in light oil on medium heat for 5 minutes. Set aside. Place butter inside skillet, allow time for butter to begin melting. Add Frank’s Red Hot Sauce & garlic powder, stir vigorously. Turn off range, and remove blended buffalo sauce from skillet. Place blended buffalo sauce in a mixing bowl. Place a layer of corn tortilla chips inside your FINEX Cast Iron Skillet. Top with jalapeños, cheddar, monterey jack, and blue cheese crumbles. Remove chicken meat from rotisserie chicken and toss in buffalo sauce. Place layer of chicken on top of chips. Repeat steps 7-10 for second layer of nachos. Dice peppers, celery, carrots, and green onions into small pieces. Top baked nachos with veggies & blue cheese salad dressing. Serve!